January 9, 2012 by Paul Knight. Average Reading Time: about 4 minutes. The grid has been used continuously throughout the world as a development pattern since Hippodamus first used it at Piraeus, Greece in the 5th century BC. A lot happened over the next 2,000 years after that, but in 1682 William Penn used the grid as the physical foundation for Philadelphia. With that, the grid began its new life in the new America. 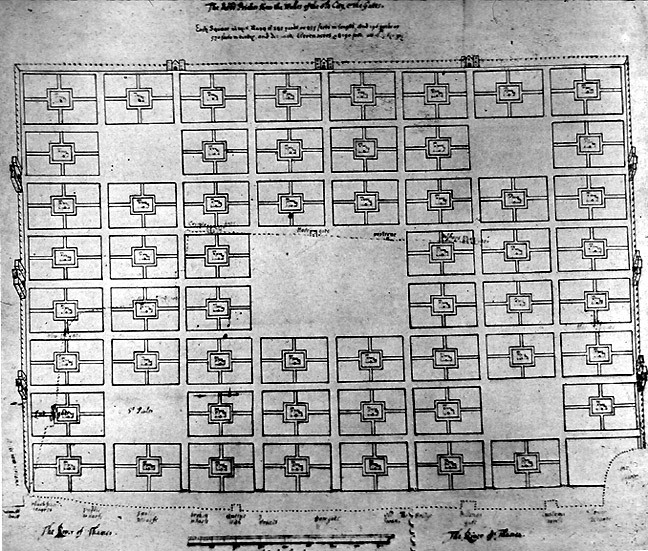 Penn’s use of the grid may have been influenced by Richard Newcourt’s plan for London following the fire of 1666. However, Penn may have utilized the grid for its indexical qualities. The grid by its very nature has no built-in hierarchy. What better way to promote the Quaker value of equality than to build it into the very foundation of your new town. Philadelphia was the first city to use the indexical system of numbers for north-south streets and tree names for east-west streets. Because of this coordinate system, the intersection at 12th/Walnut has no more or less social or political meaning than that at 18th/Cherry. Every plot of land is essentially equal to every other. Over 100 years after Philadelphia, Thomas Jefferson executed the purchase of the Louisiana Territory. Following the acquisition of such a vast territory came the challenges of subdividing, selling, and occupying it. It was impossible to survey the entire area ahead of time so Jefferson devised a system that would make platting and selling achievable from a distance. Jefferson answered with the grid in the Land Ordinance of 1785. The Ordinance divided the entire western territory into townships, sections, quarter-sections, and so on. A system of Euclidean geometry made this possible. Having never stepped foot on their property, someone could point to a map, make a purchase, and start their wagon westward knowing precisely where they were going. Today, a cross-country flight will easily show the physical ramifications of Jefferson’s decision to subdivide our territory upon the grid. The vast majority of America’s western land is so arranged in logical lattice-work. It is improbable that (for centuries to come) the grounds north of Harlem Flat will be covered with houses. As we know now Manhattan did grow and it grew well beyond all expectations within only a single century. The grid was there to accommodate that growth. In the 1920s, the roles of both the federal government and the States in the development of towns and cities were refined and codified. Amongst all of the legal changes, two documents stand out: the Standard City Planning Enabling Act (SCPEA) and the Standard State Zoning Enabling Act (SSZEA). The SSZEA specifies the creation, adoption, and use of a zoning map. The SCPEA, on the other hand, specifies the components of a municipal master plan which is made up of a zoning map and a master street plan. Unfortunately, over the last 80 years judicial interpretation over what constitutes a “master plan” has allowed the zoning map to replace the master street plan. Without a master street plan the grid is essentially impossible to execute. Thus, our American grid’s recent history has been a stagnant one. Finally today, we find ourselves in a situation where our cities develop piece-meal on a lot-by-lot basis. Because a zoning ordinance only regulates private property and does not–and legally cannot–provide for the public framework of cities, development is rendered essentially unplanned, unwalkable, and unsustainable. A reemergence of the American grid is warranted in order to restore much needed order to the places we call home. Hopefully, we return to the Great grid. I live in a suburbia waste land and it’s awful.